UDM Downloads > Global Time Synchronizer! 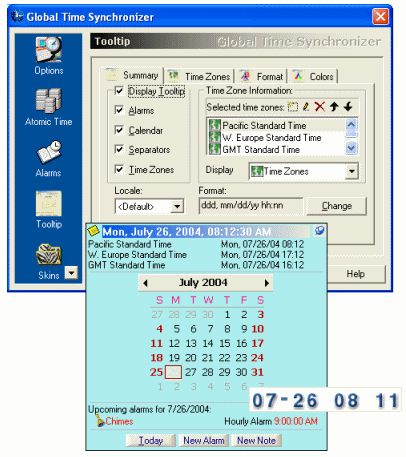 Magneto Software Global Time Synchronizer is a versatile time keeping tool that has many features including the ability to modify the look of your standard desktop clock, an easy-to-use, convenient interface that uses skins to modify its appearance, and many other unique options. Extremely accurate because it synchronizes itself with the National Institute of Standards and Technology (NIST) Atomic Clock servers. Magneto Global Time Synchronizer key features: - Fully customizable clock appearance can be modified by a wide variety of skins. - Can directly download additional skins from the Global Time Synchronizer home website. - Can be used as a floating (can be moved anywhere on the screen) clock or as a tray (replaces your current clock in the taskbar) clock. - Can be made transparent to not interfere with your daily activities - Displays calendar - Displays time in multiple time zones simultaneously and can keep track of time in different cities simultaneously as well. - Displays upcoming alarms and allows you to schedule new ones - Can be disabled or enabled at will - Displays time and date in multiple languages. - Customizable date and time format, coloring schema and opacity level - Can help you to keep track of your appointments with customizable alarms. - Alarms can run any specified action on your PC at any specified time. - Multiple sound formats supported (MP3, WAV, MIDI, and CD-Audio) for alarms. - Synchronizes time with NIST atomic time servers. - Can run in an automated mode where the user specifies the time intervals between synchronization with the NIST servers or in a manual synchronize- when-you-want mode. - Supports SNTP (the Simple Network time protocol, RFC 1769) - Time Protocol (RFC868) - Proxy support: Socks4/Socks4A/Socks5 - Date and time format is chosen according to standards of specified geographic region but can also be changed easily. - Displays time in multiple time zones, - Sticky notes and more.